Chile loves receipts. Well, they don’t really “love” them – but they are everywhere. The law requires that every purchase be given a receipt. This is true even if you are spending a few pesos on a piece of candy. You’ll encounter this receipt bureaucracy as you travel around the country. Some smaller vendors will realize that you are a foreigner and won’t bother with the receipt but that is usually the exception rather than the rule. 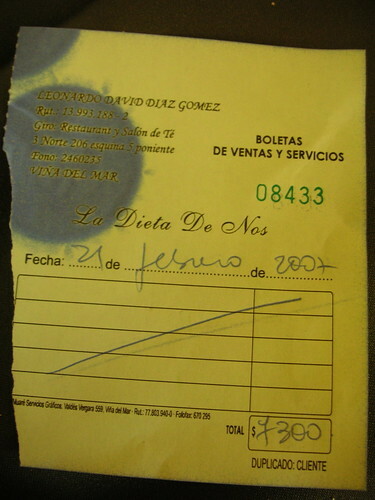 Typical Chilean receipts are called boletas, or literally “tickets”. Many are hand written on carbon copy paper that has the store’s address and even an official looking embossed stamp on them. Boletas show you the total amount you paid for the merchandise and usually a date. There is often no itemized record of what exactly it is that you purchased. When you go to larger stores like a supermarket, you actually have a choice of what type of receipt you want. This can be confusing because you’ll see signs on the checkout lanes that say boleta and others that say factura. As a tourist, you probably don’t care about factura. These are itemized receipts with a print out of everything you’ve purchased. Unless you really need this for some type of business deduction or reimbursement, you can just get a boleta. 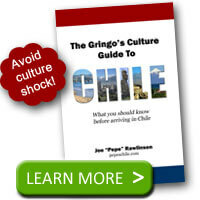 Enjoy the extra paperwork you’ll get while in Chile. 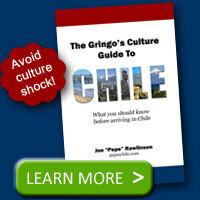 Think of the boletas as extra Chilean souvenirs. You’ll likely collect multiple versions that all have unique shapes, colors, and sizes. Just a quick note, it’s Factura. @Rob – Oops! You’re right. I’ve corrected that typo. I noticed the ink stains… Took me a day to realize that is some sort of seal. I could wallpaper a room with the boletas I collected.